We are now up to an astonishing 51 school choice programs in 24 states plus DC. We are one state short of having private school choice in half the states. Who wants to put us over the top? 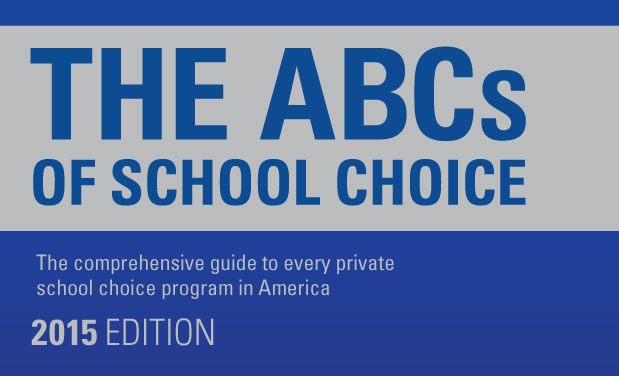 Check out all the latest stats on all these programs in the 2015 edition of The ABCs of School Choice, just released from Friedman. This entry was posted on Tuesday, February 3rd, 2015 at 4:16 pm and is filed under personal tax credits/deductions, research reports, tax-credit scholarships, vouchers. You can follow any responses to this entry through the RSS 2.0 feed. You can leave a response, or trackback from your own site. Soon we will have more states with private school choice than administering a Common Core test. Now there’s a great idea for a wager! Greg, what is your bet with Jay Mathews this year? More than eight new programs or major expansions and you win yet another dinner? You already have a week of fancy dinners in your winner’s bin, right?